This is the classic Weber whitewater run. The Eggs are a unique boating experience indeed. The run itself is short with a nice warm up drop, some boogie water, then three main ledge drops and a class 2-3 run out. It is complicated by various amounts of debris in the water. At lower flows, the run is technical. As it approaches 1500 it becomes much more pushy, sticky and challenging. A swim would result in a very long time in the water at these flows and safety is hard to set from the banks. Be aware of the dam downstream and know which channel to take - in past years, high flows can create near symmetric hydraulics in some of the chutes at the power plant. 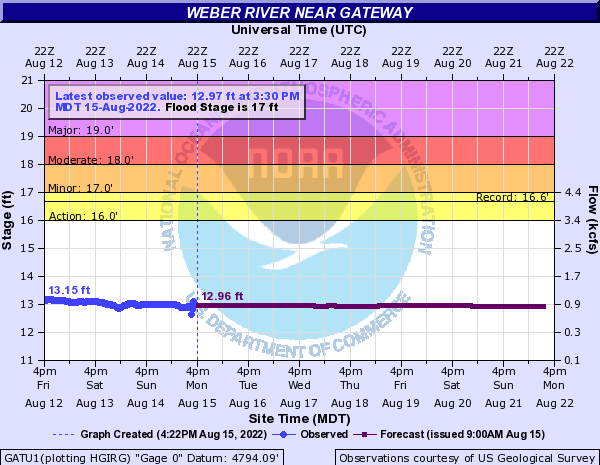 The USGS gauge is located above both the power plant, and irrigation diversions. Generally, one can expect about 200 to 300 cfs to be diverted from this section during the summer months. (Some of the water returns below the power plant which can make a nive play spot at the right flow and pool height combination.) The CBRFC may have a more accurate idea as to what the current diversion is on a given day. The take out is just east of where Route 89 crosses I-84. There is a fisherman's access and an old bridge. Hazard: Immediately below the old bridge is a potentially deadly diversion dam. Be aware of this and get out above it - especially at higher flows. The hydraulic that forms below has a 10-ft re-circulating boil and looks deadly.